Turn a dreary winter’s day into a “play day” filled with whimsical box puppets your family can make in three easy steps. Pick characters from a favorite book and retell a story “puppet show” style. Or mix and match characters from several books. You might even create some puppets that look like family members for an even livelier troupe. Use extra props and make funny voices and sound effects for a memorable performance. 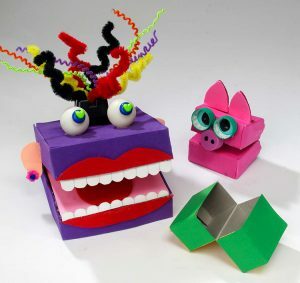 Before you begin making your puppets, collect a few empty food boxes, such as single-portion cereal boxes, which are quite easy for younger children to manipulate. As your cast of puppet characters grows, it’s definitely fun to use boxes in a range of shapes and sizes. Odd and ends, such as felt, ping-pong balls, cotton balls and yarn for beards and hair. With the front of the box facing you, draw a horizontal line around the middle of the box. An adult should cut along the line on the front and two narrow sides of the box. Do not cut the line on the back of the box. Instead, make a fold on that line so you can bend back the two connected halves of the box. Insert your fingers and thumb in the openings to test moving the “mouth” of the puppet. Paint the outside of the box or cover it with construction paper. If you are making safari-style puppets, you might want to use adhesive-backed paper in tiger, lion or zebra prints. Add craft supplies to represent the appearance of a book character or person in your family or neighborhood. Glue on ping-pong balls or plastic milk-jug lids for eyes. Make a dot in the center of each one with a marker. Add yarn or cotton balls for hair, and felt or craft foam for ears. Don’t forget to make a tongue and glue it inside where the box opens and closes. Draw teeth or lips on the outside of the box. Add other details to create a distinct personality.